They magically transform the look making it deeper, more beautiful, more confident and more powerful. By using the right colors and nuances of eye shadows we can give our eyes a different vision and shape that suits us for various occasions and moods. The Kohl is one of the first kinds of eye shadows. It was extremely popular in ancient Egypt and has quite an interesting ingredients in it. It include lead, ocher, ash, hydrating honey, oxidized copper, malachite, sugarcoated almonds. The Egyptians believed that the Khol can heal a lost eyesight and preserve the eyes from infections. Because of these protective functions the Khol was used by both men and women of different ages and in various social classes. As opposed to ancient Egypt and Iraq, in ancient Greece and Rome used the eye shadows for purely decorative purposes. Wearing makeup was considered a symbol of aristocracy and high social status. 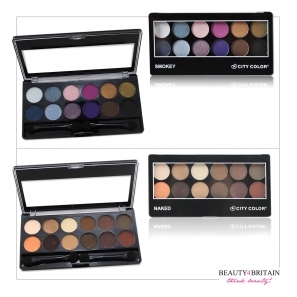 The eye shadows can be sorted in two main types – matte and glitter. Brocade - gives the makeup a festive and luxurious touch. Before it is applied to the eyelids you need to create a base of creamy or liquid eye shadows that allows the brocade to stick on.